My Grandfather was in the Army in WW2. I have his WD AGO Form 53-55 and it says he was part of the 1023rd Labor Supervision Company. Line 32 Battles and Campaigns lists Normandy, Northern France and Rhineland. His record was destroyed in the fire of 1973. I would like to know what the 1023rd labor supervision company was. What did they do? His MOS was MP 677. What did MPs do during these campaigns? Was he in some other unit/division? Was the 1023rd Labor Supervision Company listed because that's what he was attached to when he separated at Ft. Leavenworth? I've been told that the organization listed on the discharge papers sometimes is not truly what they were attached to. Any help would be so so so helpful. I have attached a copy of his discharge papers to help. Hi Bill, while researching the WWII service of my dad as well as my uncles, I found that the unit listed on their separation documents was not the unit where they spent most of their service. 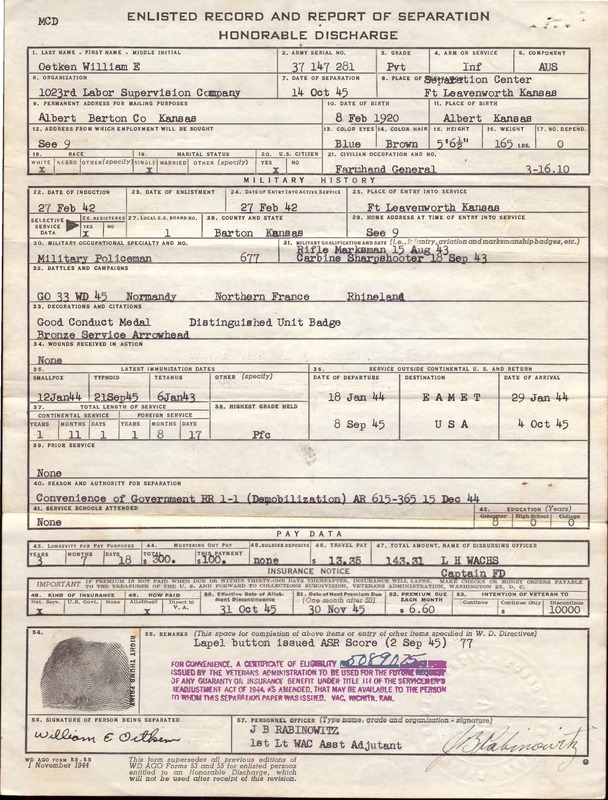 You could try searching morning reports for the unit listed starting with the date of separation and going back, to see if your grandfather was transfered into that unit during his service. If you are able to visit there, the researchers at the St. Louis Archives are very helpful. You may find this helpful, please see the records listed below, you can request these records from the following email address below by giving the the following information. We searched RG 338 Unit Histories, 1943 - 1967 and located a file unit for the 1023rd Labor Supervision Company that consisted of a 12-page historical report from 13 March 1945 to 20 September 1945. The file also contained a Transfer of Personnel by unit (no individual names) dated 13 September 1945 (3 pages); Organization Order dated 10 May 1945 (2 pages); and Table of Organization & Equipment dated 9 January 1945 (6 pages). This unit constructed POW camps for captured German soldiers. For access to or copies of this file unit, please contact the National Archives at College Park - Textual Reference (RDT2) via email at archives2reference@nara.gov. Please be aware that on a DD 214 the last unit in which one served is listed. He may have been in other Military Police units while he served during WWII.